PISCATAWAY — A non-scholarship player when he arrived to Rutgers out of Hillsborough High School in the mid-1990s and an undrafted player when he made it to the NFL, Shaun O'Hara realizes the improbability of his football career. It's why O'Hara, who has made a good living as an NFL Network studio analyst since retiring from the Giants following a 151-game career, is humbled by what he considers a career-achievement award. O'Hara arrived at Rutgers in 1995 as a walk-on defensive end, working with the scout team, he says, whenever the coaching staff wanted the running backs "to get work on their cut blocks.'' By the time he graduated in 1999, O'Hara was a three-year letterwinner and a two-time recipient of the David Bender Trophy, which recognizes Rutgers' top lineman annually. 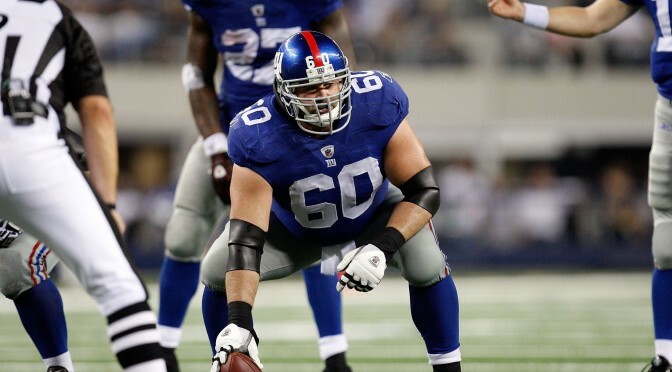 A training-camp invitee, O'Hara went on to enjoy an 11-year NFL career, playing his first four seasons with the Cleveland Browns before serving as a mainstay on the Giants' offensive line from 2004-10. Not surprisingly, he considers the Giatns' 2008 Super Bowl XLII triumph the crowning achievement of his decorated career. But Friday night, as he joined the Rutgers' undefeated 1961 team, gymnast Courtney Turner (1999-2002) and baseball pitcher Charles Bert Garrett Sr. (1928-30) as Scarlet Knights hall of famers, O'Hara took a moment to soak it all in. Joined by his parents, his wife and several friends and family members at the ceremony inside the Rutgers College Avenue Gym, O'Hara said he hopes his story can serve as a "motivating factor'' for future Scarlet Knight walk-ons with aspirations of making the roster ... of earning playing time ... of becoming a starter ... and of playing professionally. "I was just hoping to make the team and then I just wanted to get a scholarship,'' said O'Hara, 37. "This definitely wasn't one of the goals that I set out to attain. That's why it's been surreal thinking about that from where I started. But I just appreciate the journey that I went down. I also understand that it's not just about what I did at Rutgers.